Pythagoras Was NOT a Vegetarian! Meandering among the shelves of the Philosophy and History sections of the shop, I ran across a title which set my teeth on edge: “The Longest Struggle: Animal Advocacy from Pythagoras to PETA”. With a sigh, I picked the book up off the shelf and started reading the first few chapters and the bibliography to get a sense of the author’s argument(s) and evidence. The title aside, my irreconcilable difficulties with the book started as early as Chapter Three, where the author, Norm Phelps, deals with the purported vegetarianism of the widely renowned ancient philosopher Pythagoras. Now, celebrity endorsements are everywhere in today’s world. Famous personalities are recruited to peddle everything from automobiles and lip rouge, to clothing and foodstuffs. They are even paid big bucks to promote lifestyles and ideas that they may not actually follow or hold themselves. Such endorsements and advertisements are not a new phenomenon; the practice is as old as civilization itself. People have always had some kind of a fascination with the habits and preferences of notable personalities. Time and again, clever marketers of every era have successfully exploited this all too human tendency to successfully hawk their wares. However, the practice of hiring famous people to lend their names to any given product, service, concept, or way of life, can be quite an expensive proposition; unless of course they happen to be long dead. In which case, the further back one can place a claim that redounds to the credit of a particular product, service, or notion, the more authority such an endorsement will likely appear to have. Religions use this principle quite effectively in the establishment and promotion of their creeds and practices. Today, marketers and adherents of various belief systems use famous figures from the past to promote all sorts of ideas. More often than not, these endorsements are spurious as they are based on incomplete research and can usually be dismissed out of hand as erroneous (if not purposeful) misrepresentations. The assertion that Pythagoras was a vegetarian is an excellent example of one such questionable claim of celebrity imprimatur. Like Socrates and Jesus, the fact that there are no extant writings which can be attributed to Pythagoras himself leaves us at the mercy of later writers who took it upon themselves to provide posterity with ‘Pythagorean’ writings. The evidence which contradicts the widely promulgated notion that Pythagoras was a vegetarian can be found in a set of books entitled “Attic Nights” by one Aulus Gellius, an ancient Roman grammarian and chronicler. Gellius’ books include many valuable excerpts from texts which have long been lost to us, texts which were still available in his own day during his scholarly sojourn at Athens. As Aristoxenus had also studied under the Pythagorean teachers, Lamprus of Erythrae and Xenophilus, he was undoubtedly familiar with the dietary habits of “The Brotherhood” (as the followers of Pythagoras were then known). 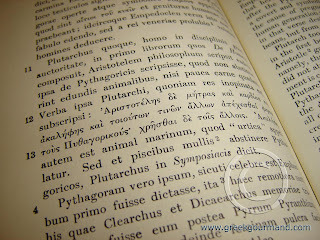 Indeed, according to Gellius, it was from Xenophilus the Pythagorean, his elderly friend and mentor that Aristoxenus learned about Pythagoras’ taste for suckling pig and young kid; a fondness which Gellius tells us was corroborated by the comic poet Alexis in his play “The Pythagorean Dame” (of which only a small fragment remains to us today). So, based on the foregoing it appears that Pythagoras did in fact eat beans and meat, just not certain parts of animals like the testicles, heart and uterus, along with certain sea creatures. All of which brings me back to Mr. Phelps and his book which I mentioned above. The only explicit ancient source which he quotes as evidence for his contention that Pythagoras was a vegetarian is a few lines from a poem by a Roman fabulist poet by the name of Ovid who is anything but a reliable source on historical matters. Suffice it to say, I did not buy the book. So, the next time you read or hear the claim that Pythagoras was a vegetarian, look for the evidence that is provided to support the assertion. Chances are there will be few (if any) actual references to original source material and the reason is pretty simple: Pythagoras was NOT a vegetarian! This coming Wednesday, I will be doing a Greek cooking demonstration entitled “Things to Do with Feta Cheese” to an audience of some 20 people or so; this is one of the recipes that I will be presenting. 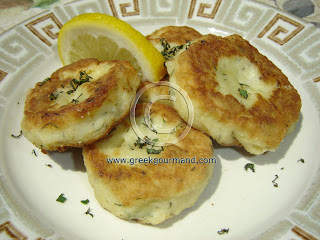 Credit for the recipe goes to my Aunt Dimitra, who has been making these tasty little bites for as long as anyone in my family can remember. 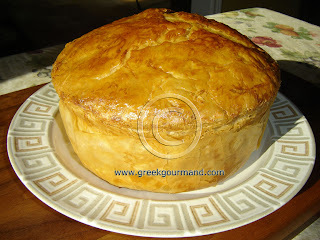 She has graciously allowed me to add this dainty to my repertoire of Greek food recipes and thereby make it my own. This little morsel is especially popular with the kiddies, and makes for a great appetizer or snack with some cold Retsina wine and a few Kalamata olives. The key to this recipe is to chill the fritter mix well before cooking to ensure cohesion throughout the frying. Peel potatoes, cut into quarters and boil in salted water until soft (approx. 20 minutes). In a large mixing bowl, mash potatoes thoroughly then add 1 tablespoon olive oil, the onion, dill, mint, oregano and breadcrumbs and mix well. Let mixture stand for 5 minutes to cool slightly. Then, add the feta cheese and the beaten eggs and mix until everything is well incorporated. Put bowl in freezer for 15 minutes to chill the mixture. Remove mixture from freezer, spoon out small portions of the mixture and roll them with your fingers into balls (about the size of ping pong balls). Place balls on a flat baking pan covered with wax paper and slightly flatten each ball into a little cake with your fingers. Roll each fritter in flour to cover completely, then place pan in freezer for another 5 minutes to firm the fritters before frying. Heat a couple tablespoons of olive oil in a large frying pan and start frying the fritters in batches over a medium-high heat for about 1 minute per side (until golden brown), use a small spatula or fork to turn them over in the pan. Clean pan between batches and use fresh oil for each frying. Sprinkle fritters with lemon juice and use some chopped fresh mint as a garnish and serve immediately. Servings: Makes approximately 20 pieces. Last summer, my wife and I decided to explore Northern Greece. So, we rented a car in Athens and added 3600 kilometres to its odometer in the course of our excursion. 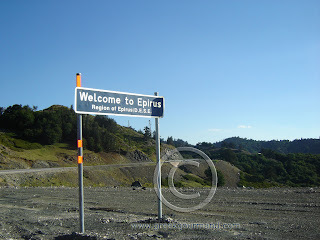 Traveling from Thessaloniki, we entered the region of Epirus by highway from the east, over and through the Pindus mountain range which forms the rooftop and backbone of the northwestern end of the Greek mainland. This corner of Greece remains a wild country; isolated, mountainous, heavily forested and sparsely populated. There is still a hint of primeval mystery that permeates the fresh clean air of Epirus, something like the coolness of an evening shade borne upon the winds throughout the region. For the gourmand, Epirus offers up a wide range of pastoral and natural bounties. Mountainside, stream and fold are mainstays of the Epirote table. From beef and dairy cattle, to sheep and goats, to wild game and fresh water fishing; the specialties of the countryside and coast of Epirus reflect the alpine character of its physical geography. No other region in Greece produces more meat or traditional dairy products. Epirote meals are typically rich and hearty and there is a particular emphasis on pitas (or pies) in this regional Greek cuisine. This specific pita recipe is from the southeast corner of Epirus, near the inland city of Arta. 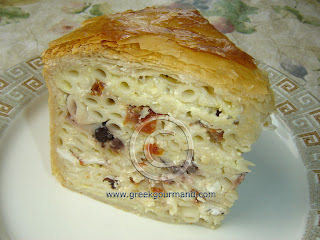 Makaronopita simply means “macaroni pie”. The return on presentation points, along with the creamy piquant smoky flavour of this specialty Greek food makes it well worth the effort of its preparation. If you want to make an unforgettable impression on your next dinner group, give this recipe a try. You and your guests will not be disappointed. The Greek cheese known as Metsovóne (Μετσοβόνε, pronounced met-soh-VOH-neh) is a smoked semi-hard cheese of Protected Designation of Origin (PDO) and Protected Geographical Indication (PGI) within the European Union. [Used in conjunction, these terms describe foodstuffs which are locally produced and prepared in a given geographical area using recognized traditional expertise and methods.] This particular cheese has a slightly pungent flavour which results from its fire-smoked curing process. If you cannot obtain this cheese (though I do recommend you try), then a superior quality smoked Gouda may be used as a substitute. Sheep’s milk (as opposed to cow’s milk) Graviera is a hard Greek cheese made according to traditional methods and it has a slightly sweet and mild flavour; if you cannot find it in your area you may try using a mild Gruyère instead (though again, I recommend using the original Greek product whenever possible). The addition of the sun-dried tomatoes and Kalamata olives in this recipe is a variation of my own and they are not necessary elements in the original preparation. In the main, this dish is essentially a slightly spicy and mildly smoky three cheese macaroni pie in a phyllo pastry shell. If there are specific savoury ingredients you wish to add, feel free to experiment according to your tastes. Authentic reproduction of the original recipe demands homemade phyllo pastry dough, though in the interest of saving time, I used store bought phyllo leaves instead. As with many Greek foods, this dish is best served at room temperature on the day following its baking; this interim allows the flavours time to meld and merge. A slight warming in a medium heat oven just before serving is also acceptable but not necessary. Boil pasta in a large pot of salted water for 15 minutes (as directed on package). When cooked, put pasta in a colander and run it under cold water and then strain well and set aside for thirty minutes to drain thoroughly. Using your hand, mix the pasta up several times as it sits to ensure as complete a draining as possible since we do not want a runny finished product. Once the pasta has drained, transfer it to a large mixing bowl, add the olive oil and mix well with your hands to ensure the olive oil gets everywhere and to gently separate any pasta strands which may have clung together as they drained. Blend the four eggs and the evaporated milk together and add to the mixing bowl with the pasta and mix it up to ensure full saturation. Add the grated/shredded Metsovóne and Graviera cheeses, along with some fresh ground pepper and the red pepper flakes, then mix well for a complete covering of the macaroni strands in the mix. Melt the butter in a small saucepan and using a pastry brush, coat the inside of a deep-walled baking dish, preferably stoneware crockery (I used a 2.5 litre round Corningware® casserole dish). Line the casserole dish with an overlarge sheet of parchment paper with the edges hanging out to serve as handles for ease of removing the pie when cool. Spread out the phyllo leaves and cover them with a slightly moist kitchen towel to keep them from drying out as you work. Working quickly but with a sure hand, brush the parchment paper with the butter and form fit the first phyllo leaf into the dish with the excess pastry hanging over the edges of the dish. Then, after brushing the interior of the dish again (as well as the excess portions of projecting phyllo) with butter, add the next phyllo leaf in a crosswise fashion and form fit this into the dish as well, then brush it with the butter and proceed to use another six phyllo leaves to line the bottom and sides of the dish. Lay them out in a star shaped (or flower) pattern and form fit each phyllo leaf within the interior of the dish. Make sure to brush each layer thoroughly with the butter both within the dish and over the top-facing surfaces of the projecting edges of each layer. Be gentle when working with the phyllo leaves as you line the dish; they are quite forgiving for such thin pastry, but you must use them loosely when conforming each to fit into the shape of the dish in order to avoid tearing them. 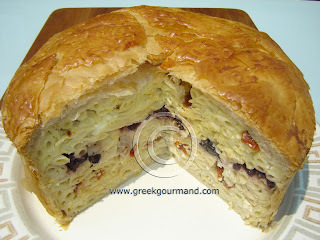 The pie’s final pastry shell should not have any holes so take care as you line the dish with the phyllo sheets. When the dish has been completely lined with the phyllo sheets, proceed to add a third of the prepared pasta mix to the dish and spread it evenly making sure to avoid any empty pockets. Then add half of any (*optional) savoury ingredients i.e., sun-dried tomatoes and/or olives, and then layer half of the required crumbled feta cheese overtop. Proceed to add another third of the pasta mix to the dish and spread it evenly to ensure there are no empty pockets. Repeat layer of feta cheese (and any optional savoury elements). Add final third of the pasta mix to the dish and spread it evenly. The pasta mix will likely end up stacking higher than the top edge of the dish and that is exactly what we want for the finished dome effect of our pie. Fold the (hopefully still soft and flexible) excess edges of the phyllo sheets back over the outer edge of the layered pasta and give this outer ring of phyllo ends a good brushing with butter. The butter will act as a bonding agent for the covering layers of phyllo such that the top layer of phyllo will seamlessly adhere to the leaves which line the dish. Cover the entire dish with a phyllo sheet and fold the excess phyllo back over towards the centre of the dish making sure to brush the phyllo with butter. Lay another phyllo sheet crosswise overtop of the first top layer and repeat folding and brushing process. Use another two sheets of phyllo in the same fashion. Using a butter knife, and following all around the rim edge of the dish, gently push the slightly protruding edges of the top layers of phyllo down within the top edge of the dish, and then brush this outer perimeter liberally with butter. Once a seamless top layer effect has been achieved and the pie is fully covered with phyllo, beat the remaining egg and brush it over the top of the pie; this will serve to give the top layer a golden-brown appearance when cooked. Place casserole dish in an oven pre-heated to 350° F. (180° C.) and bake for 45 minutes. If the top of the pie browns too quickly, or appears as if it will burn, simply cover it loosely with a sheet of aluminum foil and leave to bake fully. Remove pie from oven and leave to cool for at least one hour (if not longer) before cutting. For myself, I prefer to let the pie cool completely, refrigerate it, and then serve it the next day after warming it up slightly in the oven. Like Melitzanes Tylichtes, Moussaka, Imam Bayildi, and a whole host of other Greek food recipes, this dish is best served on the following day when all the flavours have had a chance to mingle and fully coalesce, and all the moisture has been absorbed. Before cutting and serving, lift the pie out of the dish by using the edges of the parchment paper as handles. Starting from the centre, use a sharp serrated-edge steak knife to carefully cut the pie into wedge shaped slices for serving. Serves: 8 (possibly more depending on the size of the slices).